For other uses, see Arua (disambiguation). 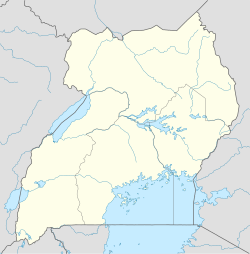 Arua is a town and commercial centre within the Arua District in the Northern Region of Uganda. Arua is approximately 440 kilometres (270 mi), by road, north-west of Kampala, the capital and largest city of Uganda, and approximately 195 kilometres (121 mi), by road, west of Gulu, the largest town in the Northern Region. Arua is an important base for non-governmental organizations working in the West Nile sub-region or serving Western Equatoria in South Sudan and the northeastern Democratic Republic of the Congo. It became an important commercial supply centre and transport route when the Yei–Juba road opened, enabling supplies to come into Juba from the south on the Kaya Highway instead of through Khartoum from the north. A branch of the Uganda Railways was extended to Arua sometime after 1964, but there has been no passenger rail service in Uganda for many years. The Vurra–Arua–Koboko–Oraba Road passes through town, in a south/north direction. The city is served by Arua Airport, which has scheduled air service. The 2002 national census estimated the population of Arua Town at 43,930. In 2010, the Uganda Bureau of Statistics (UBOS) estimated the population to be 57,500. In 2011, UBOS estimated the population at 59,400. In August 2014, the national population census put the population at 62,657. Arua has a tropical savanna climate (Köppen climate classification Aw). Arua Currency Center, a currency storage and processing facility, owned and operated by the Bank of Uganda, Uganda's central bank. Analog broadcasts, which originate from Kampala, include WBS TV, UBC TV, and NTV. In early 2014, MBC 2 was aired in Arua as a test broadcast to pave way for Vision Group's Urban TV. Voice of Life, a Church of Uganda-founded radio station, has pioneered FM broadcasting in Arua since 1997. ^ Google (2 July 2015). "Location of Arua at Google Maps" (Map). Google Maps. Google. Retrieved 2 July 2015. ^ "Road Distance Between Kampala And Arua With Map". Globefeed.com. Retrieved 2 June 2014. ^ "Map Showing Arua And Gulu With Distance Marker". Globefed.com. Retrieved 2 June 2014. ^ "Nairobi Railway Museum". Archived from the original on 26 January 2010. Retrieved 25 January 2010. ^ "Uganda Travel Advice and Advisories (Government of Canada)". Retrieved 25 January 2010. ^ USHMU (11 May 2012). "Use The Road for Making Wealth – President Urges West Nile People". Uganda State House Media Unit (USHMU). Retrieved 1 July 2015. ^ UBOS. "Estimated Population of Arua In 2002, 2010 And 2011" (PDF). Uganda Bureau of Statistics (UBOS). Archived from the original (PDF) on 7 July 2014. Retrieved 2 June 2014. ^ "World Weather Information Service – Arua". World Meteorological Organization. Retrieved 1 September 2016. ^ "Klimatafel von Arua / Uganda" (PDF). Baseline climate means (1961-1990) from stations all over the world (in German). Deutscher Wetterdienst. Retrieved 1 September 2016. ^ BOU. "Currency Centers: Arua Currency Center". Bank of Uganda. Retrieved 2 June 2014. ^ Staff, Writer (28 March 2014). "Urban TV's Faith Ariho Promoted?". Bigeye.ug. Retrieved 2 June 2014. Wikivoyage has a travel guide for Arua.